Have you ever bought a WordPress theme and then been immediately frustrated by the lack of flexibility in its design options? If you answered yes then it is time that you considered using a WordPress page builder. In this article we will look at exactly what a page builder plugin is and consider the criteria for choosing a good one. We will then discuss in depth the features and tools offered by Beaver Builder, The Divi Builder, and Elementor, and see how they can help you to design and customize your WordPress website. Although page builder plugins all offer different features and functionalities, the basic premise of this type of WordPress plugin is the same across the board. A page builder will let you design and customize your WordPress pages, giving you more freedom over the layout, look and style of your website than your theme allows. You may want to add extra content to a page, like a video or a slider. You might want to alter text or image position, resize boxes or add buttons to a page. All of these customizations can be done quickly and easily with a good quality page builder plugin. Many people also want their websites to stand out from the crowd with an original design. However, up until recently, having design control over a website was only for those with extensive coding knowledge. With the recent explosion of page builders onto the WordPress scene, you no longer need to be a professional web designer to make your creative ideas a reality. So if you are looking to create a unique website that represents your image and brand, a page builder is the way to go. The three plugins that we will discuss in this article all work on the front end of websites (although Divi actually works on both front and back end). This means you can view your edits as you make them, making the design process not only easier but also much quicker. This is an important factor for us all, I’m sure. All three plugins mentioned here also work using a drag and drop interface. This means that you don’t need to touch a line of code to make edits, unless you want too. This again improves the ease of the design and editing process, and makes all of these plugins good options for beginners and professionals alike. Lastly, when choosing which plugins to recommend, I made sure that they all provided a variety of stunning templates to choose from. 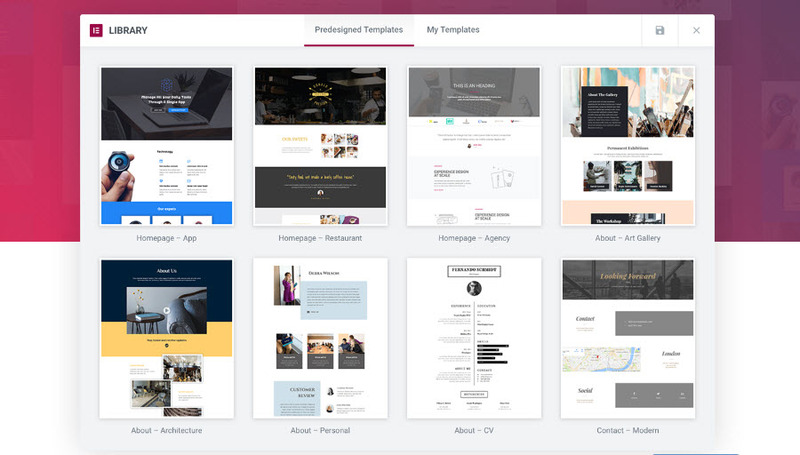 Templates for different pages can not only help you get started with your design process, but also allow you to create interesting and exciting pages within minutes. Design doesn’t come easy to all of us, and sometimes an extra helping hand is needed. 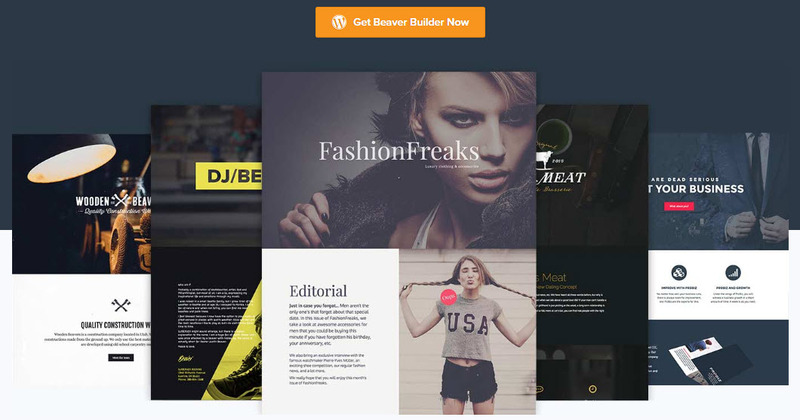 Beaver Builder is a simple to use yet powerful WordPress plugin that will enable you to create beautiful responsive pages for your website. Its impressive front end drag and drop interface means you can work directly on your website, viewing changes as you make them. And you won’t need to touch a line of code. Create column based layouts, select the position, size, and color of text and images, add videos and slideshows, as well as much much more. Customize each page to your exact specifications resulting in a website unique to your business and brand. Designs can then be saved as well as exported, allowing you to reuse them on the same site, or another. Beaver Builder also provides a variety of stunning templates. These include landing, service, and about page templates, as well as many other essential website pages. These templates will not only save you time, but make designing a professional and eye catching website easy. Even for those who are not blessed with a creative flair. Beaver Builder is a premium WordPress plugin which really does offer the complete design package. Extremely flexible and fun to use, it also comes with extensive documentation and video tutorials to get you started designing quickly. A page builder plugin that is definitely worth considering. The Divi Builder from Elegant Themes is a well known and respected premium page builder plugin. Originally part of the Divi Theme, the Divi Builder can now be used with any WordPress theme. This plugin gives you complete freedom over the layout and appearance of your posts and pages, enabling you to create an absolutely stunning website. The Divi Builder is a drag and drop page builder, that can be used on both the front and back end of a website. Again, not a line of code needs to be touched, unless of course you want to add your own custom CSS. Layout possibilities are endless and you can completely construct your site’s pages from top to bottom. Content can be easily added to your site using one of the Divi Builder’s 46 content modules. These content modules are like building blocks, and can be combined and arranged in a number of ways to create any type of page. In addition, you can customize any design element using the advanced design settings. Simply drag and drop the content modules you need onto your page, then customize to your specifications. The Divi Library makes this plugin a great option for professional web designers. Here you can house an unlimited number of custom builder elements and pre-made layouts. These can be instantly added to new pages or used again on other projects. 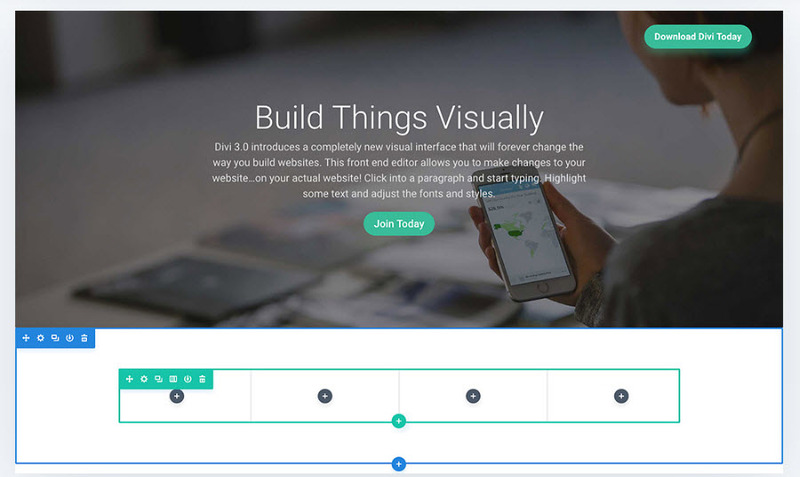 The Divi Builder’s tools can also be accessed by beginners. With an intuitive interface and a wide assortment of pre-made layouts, it is easy to get started creating stylish and modern posts and pages. As you can see, the Divi Builder is a truly exciting and versatile page builder, providing endless design and customization options for all. Elementor is a free responsive WordPress page builder that will enable you to create high-end designs. Using this live drag and drop page builder will mean that you can instantly see the results of your customizations. Design and edit any page or custom post type, without having to use any code. Elementor can be used on any WordPress theme. Extremely intuitive and straightforward to use, it provides a great user experience. This plugin gives you control over page sections, lets you add and resize columns, reposition content, and much more. Its use of customizable widgets also gives you limitless design possibilities to explore. Control every styling detail and turn your thoughts and ideas for your webs pages into reality. 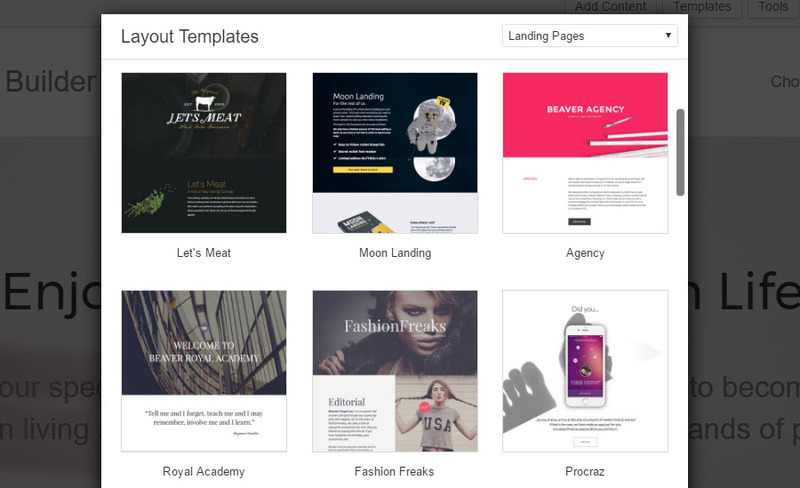 The Elementor template library is packed full of beautifully crafted templates, catering for all industries and needs. Use a template to help jump start your design process, or just to simply find some inspiration. Templates can be saved and reused, saving you time and allowing for consistency across your site. You can also import or export any template. Share your work with other designers or use it on other sites or projects. 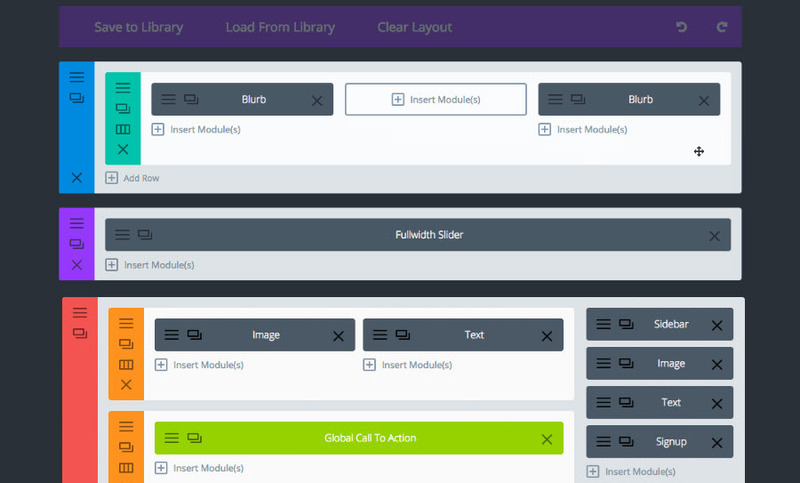 Although not boasting as many features and tools as the previous two-page builder plugins in this article, Elementor is still a great option. And what’s more, it’s free, making it a perfect choice for those on a smaller budget. Using a page builder can not only be lots of fun, it can also transform your WordPress website from bland and generic to a real show stopper. So what are you waiting for, time to start customizing your website today! Page builder called visual composer is also nice and used by many websites. Divi builder is pretty nice since version 3. Although it would be nice to add more modules in it. The front end editing is great for non tech people. are you not aware of Visual Composer?? & several addons build around that page builder ?? This article is not intended to cover all WordPress page builders. We’ll be reviewing and comparing all WordPress page builder plugins soon. My team and I have used the Origin Page Builder (free) and Visual Composer – both are very good plugins. Visual Composer gives you a bit more flexibility with the mobile layouts where as Origin page builder requires a bit more work to get things working properly. We would always recommend Visual Composer if our client can afford it and if they can’t we offer to install Origin Page Builder. It is a bit disappointing that these plugins aren’t mentioned in this article as they are some of the most well known page builder plugins on the market. Most of the mentioned pages builders, maybe all of them, will dies a slow death with the introduction of Gutenberg into the WordPress core with the next big WP update. Nobody who wants to build a future-proof site and doesn’t want to have to rework their complete content will want to rely on a fading plugin.